Mix 1/3 cup sugar and your first color of gelatin mix in medium bowl. Add 1 cup boiling water; stir 2 minutes until completely dissolved. Add enough ice to 1/2 cup cold water to measure 3/4 cup. Add to gelatin; stir until ice is completely melted. Repeat Step 1 with a second color of gelatin. Spoon 2 tbsp of the first color of prepared gelatin into each of the 16 cups. Freeze for at least 30 minutes. Spoon 2 tbsp yogurt into the cups on top of the gelatin mixture. Freeze for another 10 minutes. Then gently pour 2 tbsp of the second color of prepared gelatin mix on top of the yogurt layer in each cup. 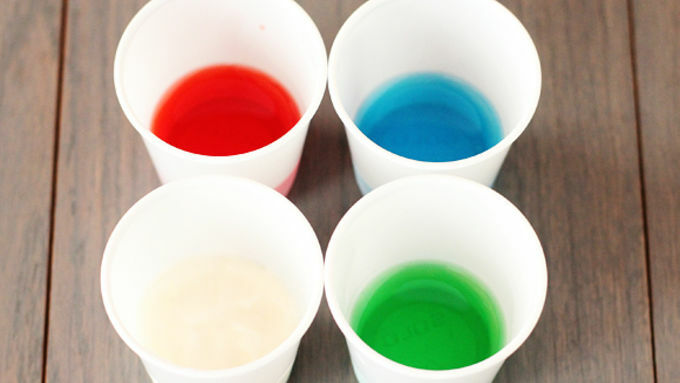 Insert a stick into each cup, then freeze for 3 hours or until frozen. NOTE: If the flag of the country you are making does not include white, eliminate the yogurt and do a 3rd gelatin color as described for the other colors in this recipe. IDEAS: Make pops in the colors of the competing countries. Host a kids around the world party. Make pops in the colors of your child's team or school. Color the pops to coordinate with another party theme (pink, white and purple for a princess party, for example). Cheer your favorite NFL team for the big game with pops in their colors! 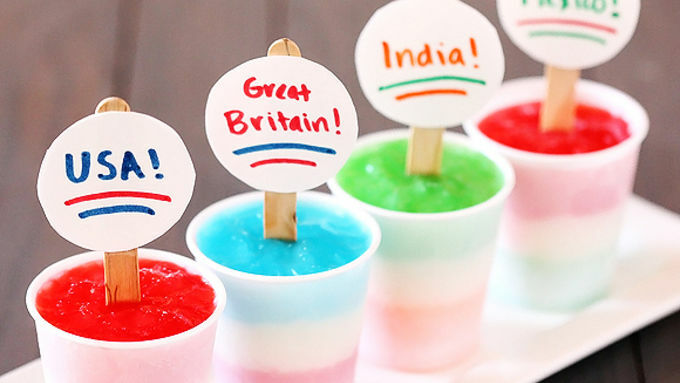 Cheer on your favorite country or team with these colorful and cute frozen pops! I admit that I’m multitasking writing this. You’ll have to forgive me, but like people all over the world, I'm rooting for my favorite teams! Without a doubt, one of my favorite things is cheering for the athletes with my good friends. It is just so much more fun to “oooh” and “ahhh” and cheer together! 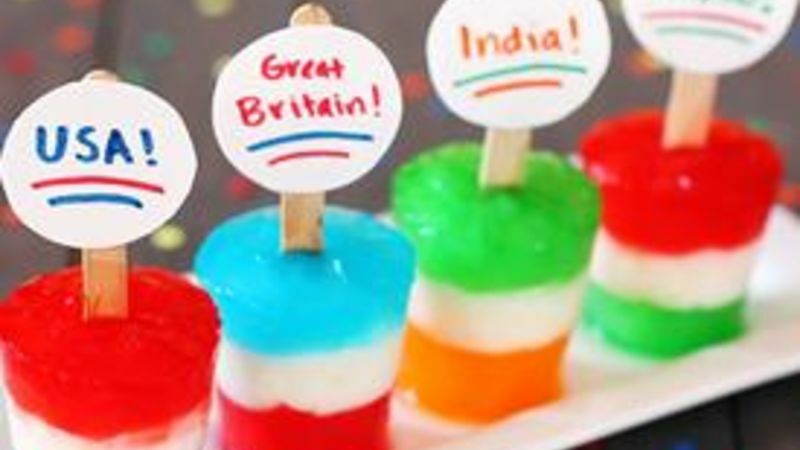 So, for a snack to bring when we watch together, I decided to make these patriotic Flag Freezer Pops to celebrate the different countries. Granted, I went a little overboard and made freezer pops for about 15 countries, but you could easily just make a batch for your favorite country. Or for the top few countries in a specific race or event. Either way, these are super easy, and a super fun way to show your spirit as you watch the excitement from London! Feel free to pop a cute label on the sticks. Or for something simpler, you can also just write something directly on the stick with a good marker. (Such as “Go USA!” or "Vive la France!" -- both in the same colors, by the way!) Then squeeze the cups and slide the pops out! And cheer on!